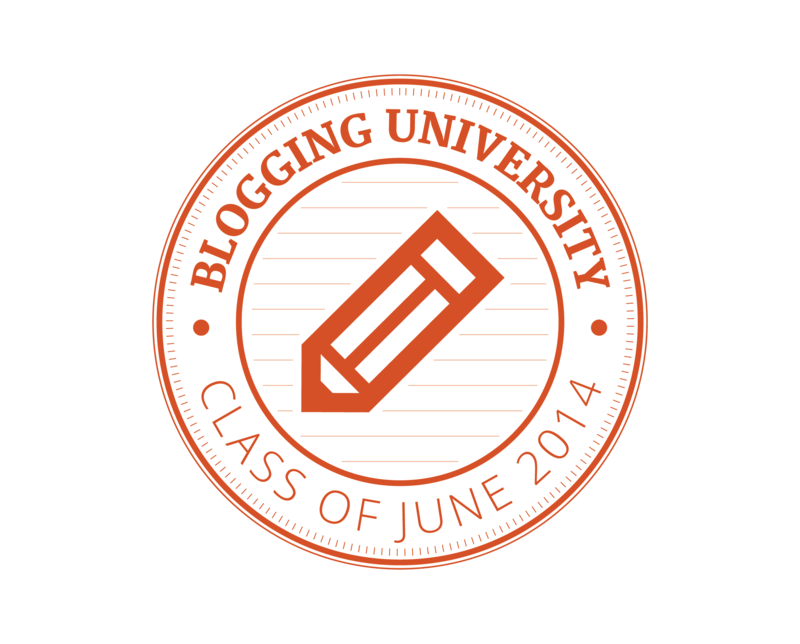 OK, here it is: The blog a day challenge day 1. I’m going to ignore the prompt and twist, because I’d already thought of this one that was to be posted for my regular Tuesday blog. Read it and enjoy! I don’t know anything about gardening, having grown up in housing projects that were ironically called Lafayette Gardens in Bed-Sty Brooklyn. Co-incidentally, my mom was an avid gardener; she grew three different kinds of mint in the apartment (called Yerba Buena in Spanish) as well as flowers. She participated in the early gardening competitions held between buildings, each building had it’s designated plot in front and tenants were given free seed by the NYCHA and encouraged to plant and cultivate. Our building won best garden plot three years in a row, a testament to my mother’s skill and vision. I tried my hand at growing avocados as a child when encouraged by my mom, and then as an adult when I had my first apartment. You put the avocado pit in a glass of water till it sprouts and then plant it, I actually got some leaves out of my avocados before they died to lack of space. They are trees, after all. Since I lost my job in February a few of my friends have offered me work, odd handyman jobs and such, but a couple of the jobs have involved working in urban backyards, and here is where gardening comes in. The first job, for my friends Anne and Paul involved cleaning up a deck that had a lot of dead leaves and foliage everywhere. It was hard work, but it was nice being outside in the sun those early spring days. I wrote a blog about it, which another friend read, and I got another outdoor gardening job out of that. Again, it basically involved cleaning, but a job is a job, and the opportunity to spend some time outside in a very nice green place in the city was a reward in itself. Thank you Janet and Larry. Which brings me to yesterday. 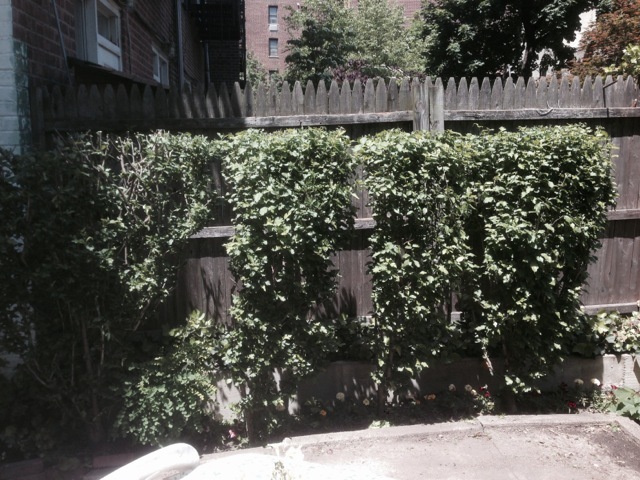 After power-washing and trimming Larry’s garden he asked if I would help out an elderly couple he knew in his building, which has a back yard with a lot of foliage. I said sure. 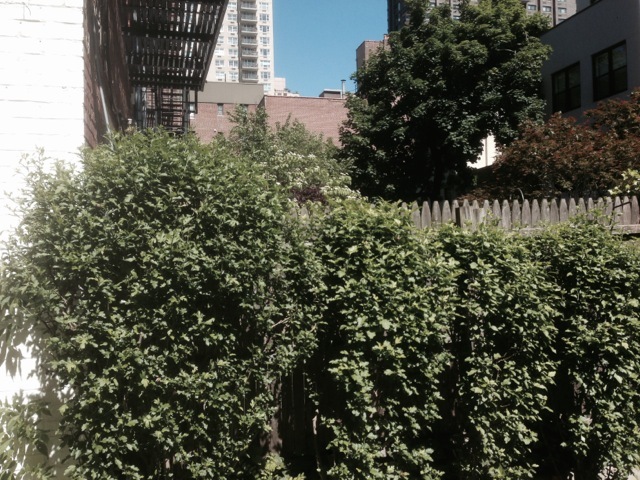 The garden I had worked on first was in the back yard of Janet’s therapy office. So this was my first chance to actually do some extensive trimming, and I was excited about that. Larry said there were some hedges to trim, and ever since I saw The Shinning I’ve wanted to trim a tree into an animal shape. Not an animal shape, just a haircut. There were only four bushes in Ellie and Eddie’s garden, and they weren’t very thick, so animal shapes were out. All they really wanted was for me to trim them evenly at the top and sides. 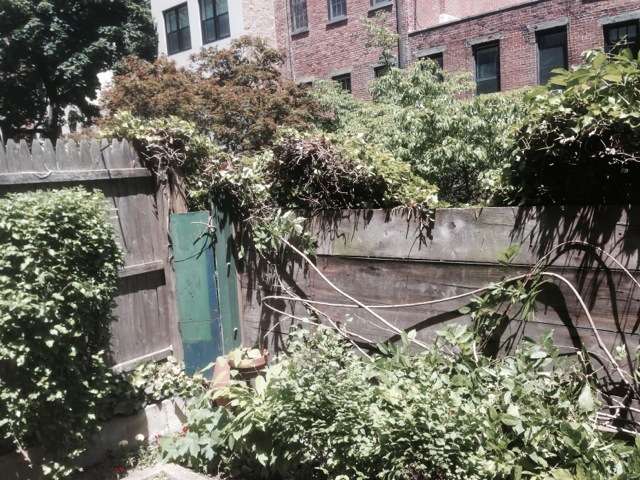 There was a lot of Wisteria that grew along the fence, and it was totally overgrown. That needed to be trimmed as well. I was also going to power-wash all of the moss from the concrete, but a broken hose prevented us from doing that. The trimming was enough work, though. 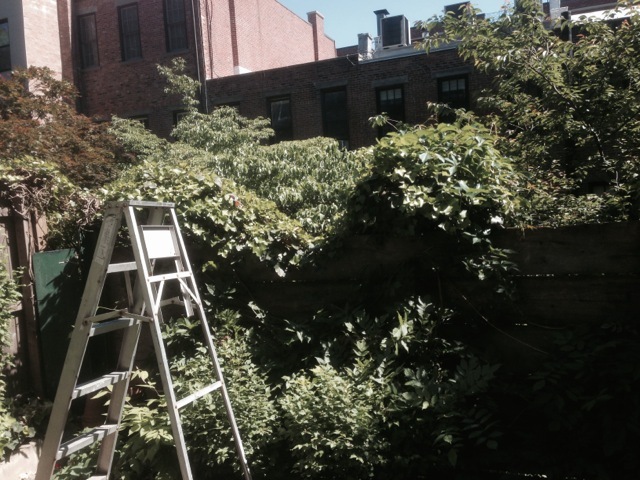 I had to get up on a ladder to get the tops of the hedges, and I worked with the big garden shears. It was like giving a haircut, except with giant scissors you needed two hands to hold. You can actually see the fence now. A few years ago the lovely Danusia and I were spending a weekend with some friends who have a marvelous home in Speonk, and the husband, Albert asked if I would help him trim the top of a tree for one of his neighbors. “Sure,” I said. I was grateful for the invitation to spend some time in a beautiful place outside of the city, how could I say no? That night Albert and I took a tree saw and a 20-foot ladder and made our way down the road. It had to be done at night because number one, we weren’t licensed tree-trimmers. Number two, it was not the lady’s tree, and it belonged to her neighbor, who ignored her request to trim the top of the tree. So this was definitely a clandestine operation. We found the tree, and I could tell Albert didn’t think I was game enough to climb twenty feet up into a tree at night and start sawing. But I did it, and it was fun. We saw a really good shooting star as we cut and sawed in the moving, shaking tree. I’m glad neither of us fell off the ladder. We snuck back to his house, only having to run behind another house with the 20-foot ladder once when a car drove by. But that was the extent of my tree trimming experience. Yesterday I could actually see what I was doing and the results were good, as you can see by the accompanying pictures. Again, it was a fun and satisfying job, albeit a little sweaty, and I managed to hurt the ring finger on my left hand. I have no idea how it happened, but it started to hurt and swell up when I got home.But I’m sure my finger will be all right. This entry was posted in Uncategorized and tagged friendship, gardening, hedges, Mexican gardener, odd jobs., tree trimming, work, writing, Writing 101 blog a day challenge. Bookmark the permalink. We were so happy with the work Xavier did. I had thought he’d be doing more gardening, but Larry had other ideas. Our garden is more beautiful thanks to Xavier.